This is for a Spiral Hanging Cone Shade Unique Floor Lamp from Shopatusm. 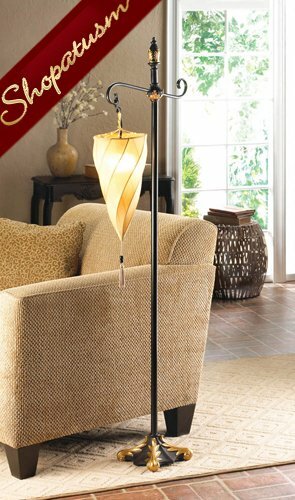 This graceful spiral-shade floor lamp exudes turn-of-the-century grace and style. The unique shade shape creates a cone of soft warmth when lit from within. Metal and alabastrite stand. Polyester fabric. UL Recognized. Max. 60 watt bulb (not included). Some assembly required. 19" x 11 1/2" x61" high.